There are two awesome tech additions at Dubai Aquarium & Underwater Zoo this year! Already home to the world’s first interactive digital shark cage, the aquarium now welcomes three interactive robotic sharks, and the world’s first 80-meter long transparent LED screen. The sophisticated 3D technology behind the robotic sharks allows them to approach and interact with passersby; whilst a high definition 15.4” touchscreen allows guests to easily interact with the robots, as they act as guides offering valuable information to visitors, sharing insights into the aquarium and assisting in the purchasing of tickets. The robots can also interact with one another, adding to the entertainment and excitement of the visitors. 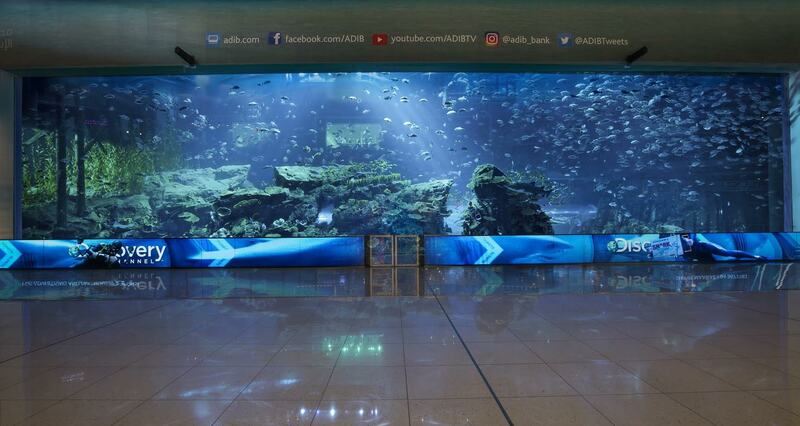 The transparent LED screen runs the length of the main aquarium tank and offers a ‘sneak-peak’ of all of the wonders on show within Dubai Aquarium & Underwater Zoo, including otters, King Croc, Shark Week and so much more! It is made up of 1.4 million LED diodes and is the first project of its kind – combining a structurally sound glass barrier and railing system, with transparent LED. The robotic sharks and transparent LED screens are the latest additions to an already interactive, tech-savvy offering at Dubai Aquarium & Underwater Zoo. The ongoing Discovery Chanel Shark Week exhibit offers an immersive and interactive experience, with the journey beginning in the world’s first interactive digital shark cage – which replicates what you’d see when submerged underwater surrounded by sharks – before leading into a 20-metre long aquarium demi-tunnel, where the back wall of the tank is made up of LG LED screens. Interactive touchscreens throughout the Underwater Zoo are also in place to offer additional information to guests, including students, with content on interactive touchscreens specifically designed to complement teaching programmes and school groups, with quizzes and tutorials. Enhancing the experience for guests and continuously adding value, these additions – including the Discovery Chanel Shark Week exhibit – are all included in the regular ticket price. The robotic sharks can be seen roaming outside the aquarium from mid-October, and the 80-metres of transparent LED screens are now on display.